Oh wow…it’s 2013! Welcome to What Kita’s Cooking!! So glad to have made it to see another January First! I hope everybody had a safe New Year’s Eve. We dined on Shrimp, and Salmon and Creamy Cheesy Grits! I am stuffed! The bubbly was flowing and I rang in the year with my three favorite guys…My Hubby, My Son and My Dad! I have been so inspired by many of the blogs that I follow, SmittenKitchen, SavorySweetLife, and so many others. So I can only hope to have a blog that is as well thought out and put together as theirs! Seriously though, I post so many pictures of the food I prepare on Facebook and Instagram, and I am always being asked to share recipes, so I thought, why not? Which leads me to this blog…it will begin with my cookbook, and over the next 365 days I will share recipes, thoughts, screw-ups (because it happens often…think sunken chocolate cake and two-ton loaves of bread) and whatever else comes to mind. I’m flakey and spacey and probably suffering from a mild case of ODD…however when it comes to cooking, I am focused and obsessive and fanatical. So I invite you to join me on this journey. I look forward to any and all feedback, and questions and suggestions. This is our journey, we will get this cookbook together, come hell or high water. So…we have 364 days left. We better get started!!! As it is New Year’s Eve, I have been enjoying a bit of the bubbly, so breakfast will definitely be brunch! 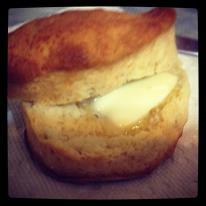 The following is an easy recipe for buttermilk biscuits that I got from Alton Brown. Not personally, because I don’t actually know him, but from his website. I’ll be serving them with leftover shrimp and grits for brunch! I actually make the biscuits at night and put them in the fridge, then bake them the next day. They can also be frozen. Another variation we love here in my house is adding sharp cheddar cheese and bacon or turkey bacon! In a large mixing bowl, combine flour, baking powder, baking soda and salt. (If adding the cheese and bacon, this would be the point when you put it in with the dry ingredients) Break butter and shortening into small pieces, then add to dry mixture. Do this as quickly as possible! Make a well in the center and pour in the buttermilk. Mix until everything is moist, dough will be sticky. Turn dough onto floured surface, dust top with flour and gently fold dough over on itself 5 or 6 times. Press into a 1-inch thick round. Cut out biscuits with a 2-inch cutter, being sure to push straight down through the dough. Place biscuits on baking sheet so that they just touch. Reform scrap dough, working it as little as possible and continue cutting. At this point, I cover my biscuits with a bit of plastic wrap and place them in the fridge. If I make a double batch, I freeze half of them for use at a later date. Place honey and butter in a microwave safe dish and heat until melted (about 40 seconds), mix well to make sure the honey is incorporated with the butter. Brush the tops of the biscuits with the honey butter mixture. 2 Responses to "Oh wow…it’s 2013! Welcome to What Kita’s Cooking!!" Loving the new blog. You almost make me wanna be DOMESTIC…almost! looks ddelicious girl!! congrats on the new blog!! !